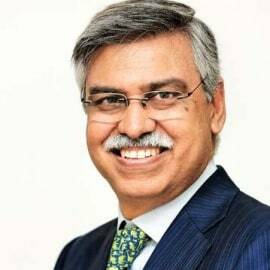 Sunil Kant Munjal is actively involved as a business promoter, an institution builder, a social entrepreneur, an angel investor, and as a thought leader. His family has promoted the Hero Group, India’s premier automotive manufacturing group that has evolved from being the world’s largest bicycle-maker to being the largest two-wheeler maker. He is the Chairman of Hero Enterprises—which over the years has incubated businesses across domains and is now growing and consolidating businesses like insurance distribution, training and cold rolled steel-making, and investing in thoughtful real estate projects that seek to dramatically improve the quality of living for India’s middle class. Through Hero Enterprises and in his own capacity, Mr Munjal has recently invested in several knowledge services and e-commerce ventures, besides start-ups in other promising areas. Besides running businesses in India and overseas, Mr Munjal has promoted diverse social initiatives ranging from healthcare to education and culture. He founded BML Munjal University, which is pioneering next practices in knowledge delivery and student development. He is the President of the Dayanand Medical College and Hospital, Ludhiana, North India’s largest hospital, medical college and nursing college. The Munjal family runs many schools with a variety of education systems, in the National Capital Region, Punjab and Uttarakhand. Mr Munjal is involved in these institutions in different capacities. Mr Munjal has also set up Serendipity Arts Trust, a unique social project that aims to revive patronage in the arts. He is also President of the Ludhiana Sanskritik Samagam, an organisation that promotes performing arts across North India. He has been a member of key government committees that architected India’s reforms in banking, taxation, knowledge and skill development and is currently chairing CII’s taskforce on Ease of Doing Business, and is President of the All India Management Association (AIMA). He has also been a member of Prime Minister’s Council on Trade & Industry that advised the Indian premier on economic issues. Mr Munjal sits on the boards of several iconic academic institutions like the Indian School of Business (ISB), Shri Ram College of Commerce (SRCC) and University of Tokyo. He is also on the boards of DCM Shriram Consolidated, Bharti Foundation, Indian Institute of Corporate Affairs and National Teachers Training Organisation —and the advisory boards of Coca Cola India, Indian Angels Network Fund and UK India Business Council (UKIBC). Mr Munjal was previously President of CII and sat on the boards off IIT Ropar, Life Insurance Corporation (LIC) and PNB Gilts Ltd. He also chaired the board of Punjab Technical University. India Today chose Mr Munjal as one of the “Faces of the Millennium” for business. In 2016, he won the Jehangir Ghandy Medal for Social and Industrial Peace. He has also received the GlobScot Award from the Scottish government. In recognition of his contribution to affordable healthcare, Sunil Munjal’s name is inscribed on The Royal Society London’s Medicine’s Wall of Honour London.